No reasonable people contend that the Holocaust did not occur. However, a great many assert that it has been considered enough, that it is time to put the past behind and effectively close the book on that era. Similarly, discussion today about the Holocaust is likely to elicit a sort of comparative or competitive response: “The Jews are not the only people who have suffered,” or something similar. While such assertions are almost tautological in their obviousness, they betray a different sort of exceptionalism around the Holocaust: the Jewish people are not the only group in history to have suffered, but they are the only ones today being told to buck up and shut up about it. Somewhere between these two responses – outright denial and exasperated acknowledgement – is a large swath of indifference. A great many people in Canada and elsewhere are aware of the history of the Holocaust, express appropriate responses to it and may utter rote pieties about preventing history from repeating itself. As a civilization, though, all of these responses have so far led to an unsatisfactory status quo. Elie Wiesel, who died Saturday, believed that understanding the Holocaust is key to the crucial need to understand human capabilities for evil and possibly to provide its antidote. If Wiesel’s formula is correct, the briefest glance at the headlines today is all the proof necessary to show we have thus far failed to consider and understand that terrible history. For decades, Wiesel was not only a global voice for survivors, but a sort of moral compass for a world that has not learned the overarching lesson of the Shoah. Speaking out again and again on issues of contemporary injustice and genocide – though some advocates for Palestinians have contended that he wasn’t as vocal on that issue – Wiesel at the same time expressed regret that his interventions should be necessary. In an interview with the Independent in 2012, Wiesel lamented that all his efforts and those of other survivors have failed to create the ideal world free of hatred and genocide. The outpouring of grief over the passing of Wiesel is the appropriate response to the loss of a great individual. But it also reflects a larger lament; it is a reminder that the generation of eyewitnesses is diminishing. For many of us – and for the world – Wiesel was the face of the survivor, the voice of the Holocaust experience. His unflinching writing on the subject defined the discipline of the eyewitness Holocaust narrative. Not only was Wiesel able to articulate and validate the experiences of survivors who could not express themselves for various reasons, more importantly, as he himself acknowledged, he had an obligation to those who did not survive. It is this same sense of obligation that motivates survivors to regularly make the emotionally exhausting effort to share their experiences with audiences, particularly young people. As Wiesel acknowledged, the world has not responded adequately. But, in the same interview, he said failure would have been to not try. 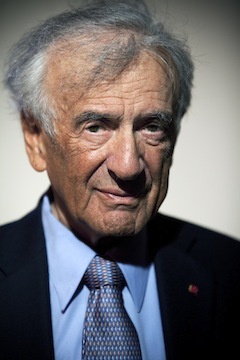 When Wiesel was recognized in 1986 with a Nobel Prize in literature, it was a recognition of his contribution, certainly, but it was also an affirmation for all survivors – indeed, for all of those whose identities attracted the Nazis’ genocidal hatred – that their experiences were valid, legitimate and incontestable. When Wiesel’s book Night was published in English in 1960, it was at the start of a global conversation of the Holocaust and its meaning for humankind. Wiesel rightly hoped, but perhaps should not have expected, that a catastrophe of this magnitude would be adequately understood or its lessons assimilated in the comparatively short span of a human lifetime. He was correct that understanding the Holocaust is a key to humanity’s future. By their actions, Wiesel and all the survivors who share their lived experiences have helped to lay a foundation for a world in which the key to peace and a better future can emerge. As the eyewitness survivors pass that responsibility along to the rest of us, it is our ambitious mission to build on that foundation and to extend their calls of compassion, humanity and reflection to a world in great need of perfecting.